Kaltura is a video streaming tool that allows students and faculty to create and share media content from anywhere and any device. Users can upload content to Moodle or Mediaspace. Content in Moodle is restricted to curricular use, while the Mediaspace portal permits sharing content outside of Trinity. Both environments share the same tools and access to the “My Media” personal library. Course viewing assignments: Students can watch course viewing assignments via Kaltura’s Moodle integration. Requests for films to be added to Kaltura are handled through the Library’s course reserve program. 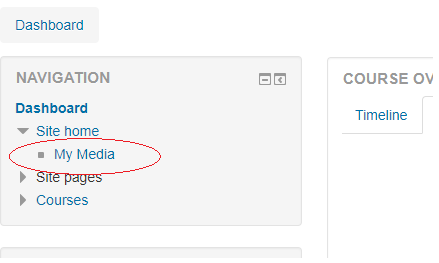 Once films have been added, students should click on “Kaltura Media Gallery” in the left navigation menu within their Moodle course. Instructors can also embed Kaltura films under Moodle Topics or Weeks for better integration with other course materials. See also: adding films from Kanopy or Films on Demand to Moodle and discovering film content in the Library’s OneSearch. Create screen, voice, and presentation captures: Using CaptureSpace, a downloadable desktop application, you can record your screen along with voice and/or presentation slides, trim and crop the video, and order closed captions. Create student video assignments: Kaltura can accept content students create as part of an assignment. In Moodle, “Add an Activity or Resource” and select “Kaltura Media Assignment.” Students can then use this assignment area as a “dropbox” for their videos to be graded. Mediaspace is accessed at trincoll.mediaspace.kaltura.com. Trinity users may login using their Trinity credentials and access the CaptureSpace screen capture tool, upload content to their “My Media” personal library, order captions, and then share content with those outside of Trinity. You can also create “channels” within Mediaspace for grouping videos together and sharing them under restrictions that you designate. To do so, login to Mediaspace, click the Channels tab, the the blue “Create Channel” button. There are several different permission levels you can set for the channel, from completely private, to campus-only access, to open to the public. “Logged in” means that videos will only be shown once a Trinity user logs in with their credentials. (If a user tries to access via a URL, Kaltura will prompt for credentials before playing the video). “Channel members” means anyone you add to the channel. KMS Go is Kaltura’s lightweight mobile app that can easily capture and upload audio, video, or still images to your My Media collection on Kaltura. The app is a free download from the app stores for either Android or iPhone. When prompted, enter the site URL https://trincoll.mediaspace.kaltura.com and login with your Trinity credentials. Using a Mac OS and encountering an error having to do with “3rd party session cookies”? See this post for the easy solution. Content licensed under a Creative Commons Attribution-ShareAlike 4.0 International License.